Tamera Mowry-Housley has a lot of change happening in her life right now. The end of her reality show with her sister Tia, her new talkshow The Real, and now, a new 'do! Just last week she was pledging her love to her long, wavy locks, but last night we knew something was afoot when she tweeted a picture of her hair on the floor, "This is happening right now. Thanks @ShaiAmiel for my beautiful cut. Can't wait to show y'all pic.twitter.com/IZk0dIt3x8." Tamera has been transitioning since last year, and lucky for us she's been Instagramming pics of her transition hairstyles along the way. Perhaps she was inspired by the New Year to embrace a whole new look too! If you're feeling intimidated by the thought of styling your freshly big chopped curls, don't be. Shai says just "Wash & go!" That's what he did with Tamera, because she wanted "something simple and playful. I gave her a vintage style bob that resembled early century hair. Her curls will give it that old fashioned look." "She can diffuse for added bounce but I think it's gonna be an easy wash & go." From what we can see on Tamera's Instagram, she's already having fun accessorizing her new easy look. Lately, Shai has noticed an increase in the number of women wanting big chops from him, and we've definitely enjoyed seeing the celebrity reveals on social media. The plethora of celebrity and real life hairstyles on Instagram and Pinterest have made it much easier than it once was to find hairstyle inspiration for the big chop, which Shai says is an essential step in the process, "look for inspiring looks. Take your time researching different styles. My Pinterest is loaded with great haircuts of all lengths." Step two in your big chop preparations? Shai says you should "do your research to find a stylist you trust and see if they've done this. Read up their reviews and see if they have pictures of their work. They say a picture is worth a thousand words." Once you've found a style and a stylist, be sure to snap a before and after selfie of your big chop to share on our NaturallyCurly Facebook page, our community loves before and afters. 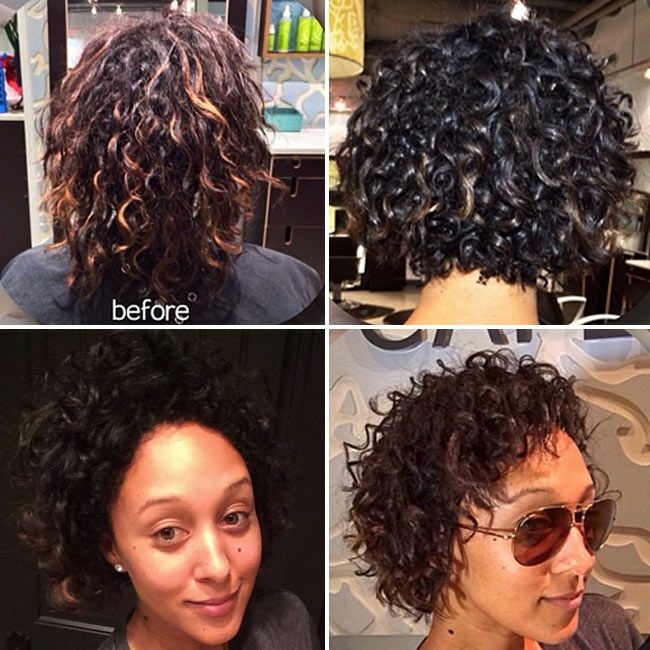 What did Tamera do right after her big chop? "She gave me a big hug and said it's 'the bomb.' She kept looking at herself in the mirror and playing with it. She couldn't keep her hands off it. She grabbed my phone and took a lot of selfies; that's a good sign. She posted it on Instagram as soon as she arrived at her house and it was late!" We have a feeling this isn't the last celebrity big chop we'll be seeing this year.